Winter is in full swing and we are all in hibernation mode. Okay, some of us rally in the colder months with activities like cross country skiing, frolicking in snow or adventuring in the great outdoors. But for some, freezing temps mean time to snuggle indoors. What’s better than curling up in front of a fire and binge-watching movies you’ve been wanting to see? (Netflix and chill, anyone?) Why not find a little décor inspiration while you’re snacking on popcorn, drinking hot cocoa and catching a flick? When it comes to movie classics to watch for design ideas, the options are endless. Recently we caught a couple of award-winning films that have captured our imagination: The Grand Budapest Hotel, Amelie and It’s Complicated. We want to share our design inspirations with you. 1. Consider unlikely color combinations. In The Grand Budapest Hotel, color is a main player, captivating attention from the first frame. Production Designer Adam Stockhausen and Set Decorator Anna Pinnock created a stylized, Art Deco world of delicious hues. Their work won an Academy Award for Best Production Design in 2015. 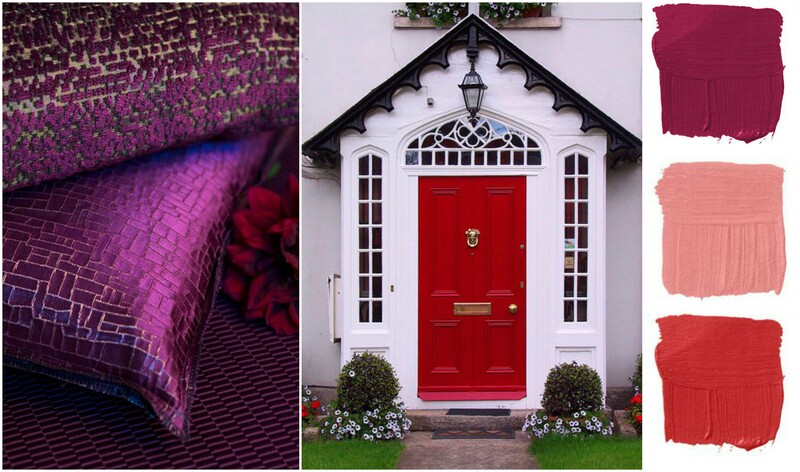 We love the idea of using a bold red with soft pinks or painting something with red lacquer and accenting it with a royal purple textile. Call us revolutionary: we find unusual color palettes can be visually stunning. 2. Wallpaper and quirky art make a perfect pair. 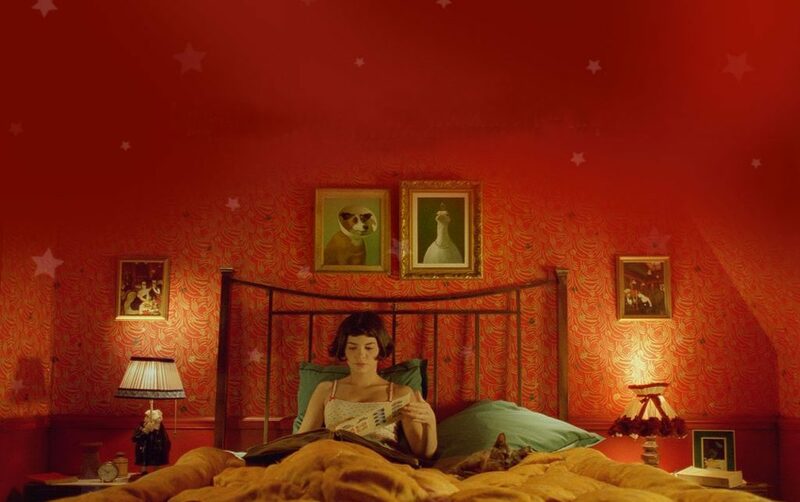 We fell for the young ingenue in the French film Amelie, played by actress Audrey Tautou. She lives in a world of her own, deciding to help others–and along the way she finds love. We were drawn to the film’s whimsical interiors, particularly the sweet wallcovering in her bedroom adorned with quirky art. Even her bedside lamp is over-the-top fun. 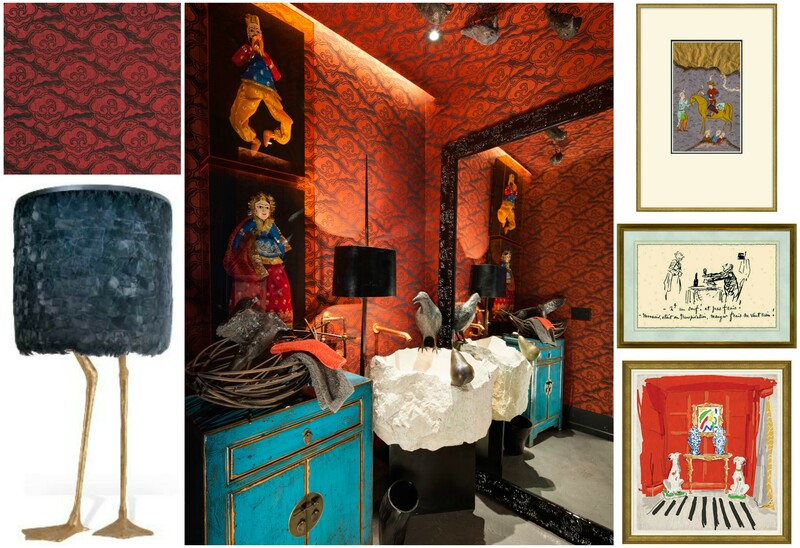 Try wallpapering a powder room and layering it with a playful display of art. You can also light up a room with a fanciful lamp. Center Image: Photo by Haven Interiors Ltd. Above wallpaper, lamp, and art available by order through Haven Interiors Ltd.
3. 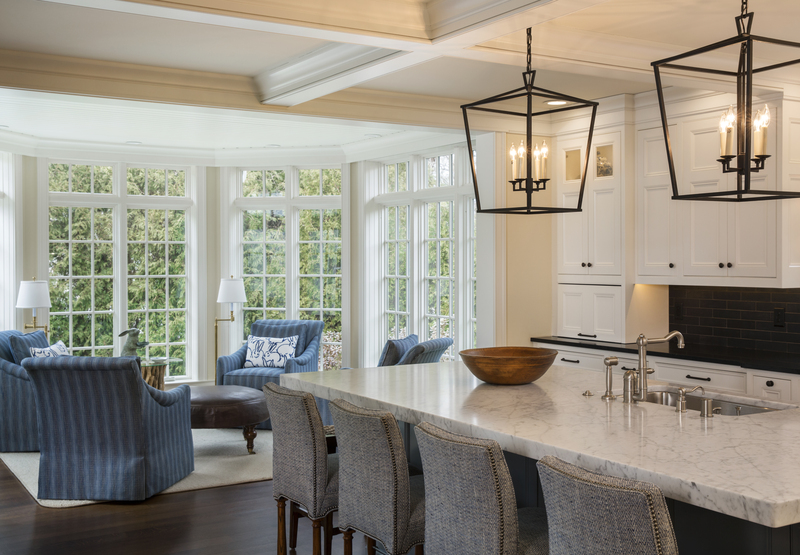 Cozy kitchens never go out of style. 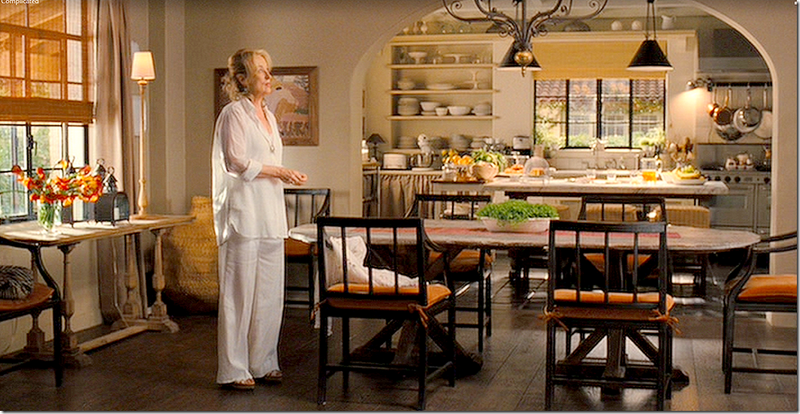 Director Nancy Meyers is known for her film’s interiors, from Something’s Gotta Give to The Holiday. In her film It’s Complicated, Meyers, along with Production Designer Jon Hutman and Set Decorator Beth Rubino, fashioned a home kitchen inspired by the main character’s passion for baking. The earthy tones, natural textures and light-infused walls are inspirational. Add a crisp linen or woven-wood shade to your kitchen windows to create a similar look, or layer your shelves with earthenware vessels and cake pedestals quietly awaiting something delectable. 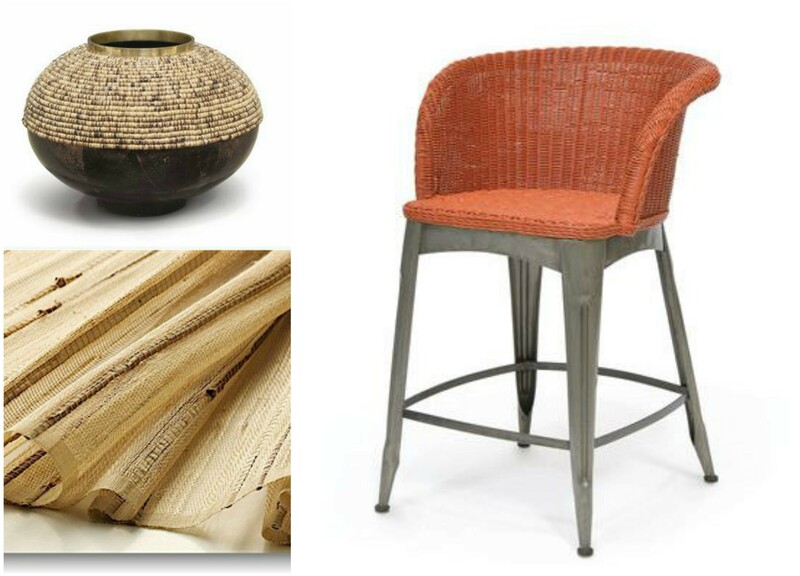 Above Image: Photo by Haven Interiors Ltd. Accessory; woven shade, and bar stool pictured above available by order through Haven Interiors Ltd.
We hope that you are enjoying the winter season, whether you are hibernating by a fireplace or skiing down mountains. Create your own list of must-see films or check out Elle Décor’s “20 Movies To Watch Before Decorating Your Home” for additional ideas. Be sure to follow us on Instagram for more design inspiration. Let us know which films are moving you to do a little re-decorating. We’d love to hear from you!